My first trainer was a flop. It was fast, nimble and great fun for my teacher to fly. For me it was all wrong. There are two types of beginners - those who belong to "the joystick generation" and those born before them. I was in the older group. My first trainer would have been fine for someone under the age of 20 or so, but I was over forty. I did not find my perfect trainer until a couple of years later. The Kit version of the Sig Kadet Senior. My original one was kit built and since then I have built 7 Kadets of various types. But my favorite remains the original Kit version. I also have the ARF version with its ailerons and extra two inches of wingspan. And I have the smaller LT 40 and the Seniorita. But for me, the absolute best trainer for the older learner is the kit version of the Kadet Senior. 1. It was designed as a trainer. It is not a high wing sports model. 2. It has lots of dihedral for stability. This thing will just about land its self. 3. It does not need a large engine. I like to use 50 to 60 size four strokes. And it is economical to run. 4. The full size plan allows you to very easily duplicate any parts you may damage. It is long lasting. My first is now over 16 years old and still going strong. 5. It flies slowly. This gives the novice time to make mistakes and then time to correct them. If you have some height, just let go and it will sort its self out for you and return to level flight. 6. It is fairly large. Cover it in yellow and you can see it forever. 7. It can fly in any weather but as it has no ailerons, it is best to take off and land directly into the wind. 8. It is relaxing to fly. It knows how to fly better than you do. 9. It loves four stroke engines. Their ability to work at mid revs is perfect for the Kadet. 10. And finally - it is fun. It is surprisingly agile for such a simple design and it is fun trying to get it to do things it was simply not designed to do like inverted flight. Or fly off water. 1. It is large and may not fit in all vehicles but then there is the Seniorita or the LT 25 and 40 which fly almost as well. 2. It is a kit. You have to get the knives and glue out and build it. It is not particularly hard and the book is excellent. If you take your time, you will get there. There is always the ARF version. 3. It flies like a trainer should. Docile and slow to react but these are also its strengths. 4. It is slow. Very slow if you want. If you have the need for speed, this plane is not for you. In summary. The Kadet Senior is an ideal trainer. Slow, stable and will get you taking off and landing faster than just about anything else. But it is not a speed demon and will not win any aerobatic contests. Keep it light and enjoy real "on the wing" flying. The ARF version is almost as good but does not have quite the stability of the kit version. It does, however, have greater aerobatic possibilities with its ailerons. Mine has a Saito 65. Nice summary of the Sig Kadet Senior Michael. Very nice looking bird too! You can't leave us hanging like that man, what was your FIRST trainer than your teacher had so much fun with? G'day Matt. Ok. Here is the terrible story of my first model. My teacher wanted me to build a Thunder Tiger Eagle 40 but none was available so he substituted a Great Planes Trainer 40. I added a Super Tigre 45 which was fine. The problem was that this was going to be my first construction job since building simple control line models 12 years earlier and the Trainer 40 was not all that straight forward to build. I managed to build a large twist into the wing which made it fly quite poorly and then to add insult to injury my teacher ripped the elevator off in a very tight Split S turn and pranged the model. I rebuilt and finished late one night during the Christmas break. Sadly, I forgot to glue the elevator hinges in and the next flight was very short and resulted in a broken plane, broken engine and much grief. As a result, the next plane I built (for my then 12 year old son) was a Great Planes PT 40 with a flat bottom wing. My teacher hated it but it was a far better trainer for me than the Trainer 40. Within three months, my son was taking off and landing and I was still doodling around. 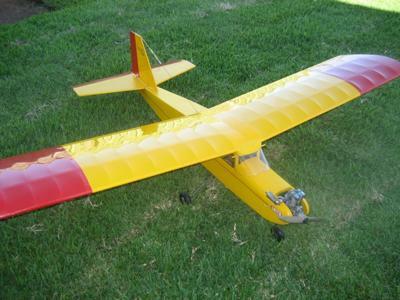 I did not get to take off and land until I build a Dynaflite Butterfly which I powered with an OS 26 four stroke. That I could fly, land and take off and it lead me to the Sig Kadet Senior via a couple of other less successful planes which shall remain nameless. Once I built my first Kadet, I was on my way. How old was your son when he first began flying? I have a 3 year old boy who LOVES planes. Might have something to do with all the cartoon planes painted on his bedroom wall, or all the planes in the garage, lol. I can't wait until he starts flying! I am building a Kasdet Senior. The kit says to use a .29 to .43 engine. I plan on using a .46. Is there a problem going as big as you di with the .60? G'day It really depends on what you want to use the plane for. The best engines I have had in my Kadet Seniors have been four strokes. Two strokes try to pull the plane around too fast. It is a very "dirty" airframe and flies best slowly. As a trainer it is best with something like a OS 40 LA or a 52 four stroke. As a fun plane, more can be better. A 46 two stroke like an OS 46LA will be fine but much more and it is just too much. A friend has an Enya 50 in his and he finds the best way to fly it is to climb, stop the engine and glide it! One of mine will glide for about 5 minutes after a 30 second engine run. Any four stroke between 50 and 65 is also fine and much better than a two stroke of any size. The most powerful engine I have had in a KS was a Saito 72 but it spent most of its time at less than half throttle. It did make for very short take offs though. And remember, the best thing you can add to your Kadet is lightness. Neat plane and ive built two others ( one has a KDA22-20L brushless and 1800 lipo battery) , gets nearly twenty minute flights and is stock standard. In fact I just took the OS.25 fp motor and tank out and installed the electric.. I have had two Seniors of my own and I plans built one with my son (which I still love to fly.) The idea to build one from plans was shortsighted; I spent more than the kit sells for. I suggest one mod that really improved the appearance and maybe reduced the stall speed: Add false ribs between each of the stock wing ribs; the two hours of effort really enhance the plane; I am surprised Mr.McCullogh did not include them originally. Another thought; the plane can be a little heavier without noticible flying penalties. You might consider using aluminum landing gear. Or if you want to add features for fun, flaps, spoilers, lights, the plane will suffer the additional weight easily. I am going to set up mine for banner/glider towing. Enjoy your planes, good landings. Thank you for the excellent write-up on this airplane. I have been looking at a lot of different models, and I keep coming back to this one. The online build manual has a warning about flying in winds over 10 mph, which had me worried about being able to fly here. After reading your article, and all the responses, I do believe that I will pick up a Senior soon. I'll have the winter to build, and can start training in the spring, with some simulator time while I build. It was great to read the comments of someone who had flown several other aircraft also, so there was an experienced point of view. I needed that. Again, thanks Michael, and to all who also added additional feedback. Gary - if you build one, you won't regret it. As I write this, Number 8 is currently under construction. They were designed for two stroke engines in the range 29 to 35 but I like to use four strokes in the 40 to 72 range. My present Kadets have 56, 65 and 72 Saitos. The 56 flies it perfectly, the 65 is very similar but as it is a heavy engine it also balances it perfectly and the 72 is just plane fun. The big advantage of the four strokes is their ability to chug along for ages at mid or low throttle settings. Modern ABC engines are not so happy at low throttle settings for long periods especially when new. My oldest model is convered in Solatex iron on cloth material. I find that his lasts extremely well - far better than iron on plastics. My second is an ARF and it is looking quite old despite its relatively young age. The plastic covering needs a lot of careful looking after. My newest is a hybrid. The fuse is covered in Solatex but the flying surfaces are covered in Solafilm for lower weight. The Solatex model is the best in windy conditions though the others are very little different. The main point to remember when flying in windy conditions is to ALWAYS take off straight into the wind. This is where a more powerful engine helps though even my smallest 56 will take the Kadet off in about 20 feet. The 72 positively leaps into the air. Landing is less critical. Though once the model is on the ground, any attempt at turning across the wind will result in it tipping over onto a wing tip in higher winds. Best to turn it into the wind and walk and collect it. Well, back to the workbench to continue with Number 8. It is going to get an exotic engine of some sort. Laser 70, Laser 80, Saito 90 Radial, Saito 90 twin? Not sure which just yet. I've been flying a Senior ever since Sig came out with it. I've always used an Enya 46F/C and have found that engine more than enough for the plane. I've used the Senior as a camera plane and to drop candy and even a parachutist. It makes a great tow plane with a 60F/C. I'm now building another one because I let my Nephew "borrow" one to learn on and all I got back was the engine and radio gear. He said the wing folded in flight. Have you ever seen a Kadet just fold a wing in flight? Not going to happen unless you had a really bad landing and damaged the wing. He says he never had a bad landing but who knows? This plane was 12 yrs old when I let him take it. Oh well it did give me an excuse to build another. It's a great and fun plane to build. Hello Michael from Oz, and also to the others who commented on this page. I have made the decision and purchased the Kadet Senior, and will commence to building it this spring. I have a Magnum 46LA engine and a Futaba 4 channel radio. As I learn to fly this airplane I plan to build a second wing with far less dihedral and ailerons to allow me to learn aileron usage after I am proficient at using the rudder. It seems that there are several Kadet Senior kits flying at the local club, and everyone likes them, even the folks that don't own one. Again, thanks to all for your input. Laser powered Kadet Senior launched. Well, I have done it again. I have built another Kadet Senior. The one in the picture at the top is "resting" at the moment as it suffered minor damage when a gust of wind picked it up off the ground and threw it at me. The rudder hit my hand as it went past and it broke the main rudder post. I have repaired it but so far it has not been flown again. The new one (which is known as Red Kadet) has a red Solatex fuselage and a yellow translucent Antique Solatex wing. The really interesting bit is the engine. My oldest Kadet Senior has a long serving Saito 56 which makes it a perfect trainer and I use it for training other new flyers. This one has an English made Laser engine. It is a 70 size engine and quite large and heavy but it has turned out to be quite powerful as well and very close in power to my Saito 72 though it does not need nitromethane like the Saitos. Red Kadet is slightly nose heavy with its large engine. This makes it a little more docile but also a little less able to self recover. It is nice to fly, however, and I have been having a ball with it. It is quite fun to fly it inverted. Half roll then lots of down elevator and try to stop it rolling back to normal. Fun. It is also fun to fly when there is some wind about. Point into the wind and gradually reduce power to idle while gradually feeding in more and more up elevator until it just sits there like a kite and can even go backwards. The Laser engine is an engineering masterpiece. It is also quiet, very easy to start, does not need muffler pressure, does not need Nitro, and has idled perfectly right from new. It has the most stable idle of any engine I own. It is nothing short of brilliant and is built like the proverbial brick outhouse. See www.laserengines.com if you want more info on these very fine engines. My modified Kadet Senior will climb vertical with a Rimfire 1.2 and 18.5V 5000ma lipo battery. 20 minutes of flight time just doing takeoffs and landings. I have three Kadets, One stick built Senior, & one Seniorita..both three channel & one older Arf Senior. Never a hairy moment with any of them. All three joys to fly. Best slow flyers built. Well since I wrote this article things have changed for me. I have moved about 200 miles and now live near Canberra, Australia. I have also built a new Kadet Senior. Initially it had a Saito 90 Radial. Total over kill but I wanted a model to test the engine in. It turned out that although the little 90 Radial sounds amazing, it is not all that powerful. I think it is about as powerful as the old Saito 56 I had. So recently I removed the Saito and converted it to electric. I used a Turnigy EasyMatch 46. There are three versions and I used the 550 kV version. I am running 5000mAh 4 cell lipo packs and a 13 x 8 prop. It flies very similarly to another that I have which has a Saito 62. Plenty of power and flights of up to 20 minutes. It is pulling about 30 Amperes and I think the speed controller is a Turnigy Plush 40. The other change I have made is to build an aileron wing for Red Kadet. I reduced the dihedral to about half of the original but I still used the original dihedral braces. I have not managed to break it yet. I made the ailerons the same size as Sig's ARF version - ie, they are 7 rib bays long and about 3 inches deep. The modified Kadet will roll well on half rates, flies inverted quite well and is far more tolerant of cross wind take offs and landings. Oh yes, I have a new Seniorita kit in the box and a new Four Star 60 too. I love Sig's kits. Yes, I have done it again again. I have recently finished a Sig Kadet Seniorita. The Seniorita is a 63 inch wingspan version of the Kadet Senior (78 inches) and is just a scaled down version of the Senior. I had one a few years ago and flew it with engines from a 30 four stroke to an old OS FS 40 and even a PAW 15 (2.5cc) diesel. All the engines were fine. This new one has an ASP 30 four stroke and with this engine I can easily take off across our strip. It is not short on power. It flies like all Kadets. Slowly, smoothly but it MUST be taken off directly into the wind as it has no ailerons. I have the rudder on the aileron channel which makes flying it very easy. It is covered in adhesive backed Solatex cloth. It is a little heaver than Monocote but lasts and lasts. My oldest Kadet Senior is now almost nine years old and is also covered in Solatex and still going strong. We must see some pictures Michael from Oz. A video of the new Kadet Senorita would be awesome as well! And another one. Kadet that is. Well I have done it again. Again. Yes, I think this is Number 9 of my Kadet Senior(ita) builds. Like most of my Kadets, it is built according to the plan. No ailerons but with a couple of small mods. I have eliminated the small curve at the bottom of the vertical stabilizer, and I have not put in the lower cover sheets under the engine. Eliminating the curve means I did not have to cover a very small complex curved shape and eliminating the cover under the engine makes engine fitting and cleaning easier. The gunk just falls out. This one has an OS 46V series four stroke engine with an APC 12 x 6 prop, an 8oz tank and is fitted with Hitec radio gear and servos. It is covered in RED Solatex and as yet, I have not fitted the side windows. I suspect they will remain unfitted. So how does it fly? Brilliantly. Just like a Kadet Senior should. She is slow, steady, stable and a delight to float around. I have set the radio so that both the right and left sticks control the rudder (I fly Mode 1). This means I can steer it on the ground with the left stick and in the air with the right or left sticks. And now to her first crash! Yes we had an incident. A mid air. With ANOTHER KADET SENIOR!!! I happened when we were happily floating around together and another model had a spectacular crash on the strip in front of us. I momentarily took my eyes off my Kadet (which can fly quite well without me) and when I looked up a couple of seconds later our two Kadets were about to meet. There was the sound of a crunch and both Kadets just continued to fly on as before. The other Kadet pilot decided to land so while he was landing I did a slow pass to look for damage. There was a large hole in the left wing leading edge and quite a bit of flapping covering. I landed as soon as I could with no further problems. The amazing thing was that she flew just as well with a huge hole in the wing as she did with a whole wing. The other model had some damage to a wing tip and his wing had been knocked out of line. I repaired mine that afternoon and she was back in the air next flying day. And now a question. How do I post some photos of the damage and the plane?